Ho-ho-hopping on board Wightlink Ferries’ fast and convenient car and foot passenger ferry crossings, travellers don’t have to go too far to enjoy Christmas celebrated just as it should be, and in style, at one of the country’s most loved holiday hotspots. Santa Claus will be residing at Needles Landmark Attraction’s Christmas Grotto on most weekends during December. Along with meeting Santa, visitors can enjoy free entry to children’s rides, Jurassic golf, sweet making demonstrations and even a visit to the elves in their workshop as they get gifts ready in time for Christmas. Tapnell Farm’s Christmas Open Studioshave an exciting selection of creative and imaginative, locally made Christmas gifts in stock. From unusual stocking fillers, to statement art and special jewellery, a visit to the studios is the perfect option for those in search of special presents for loved ones. The studios are open from 5th – 6th December. The Brighstone Christmas Tree Festivalis an exhibition of over 160 Christmas trees in seven different locations around the pretty village of Brighstone. Festival revellers also have the opportunity to stock up on locally made presents, listen to the carol service, watch the tree lighting ceremony and sustain appetities with a winter BBQ. The festival takes place from 10th – 13th December. Step back in time with a Victorian Christmas at Osborne House. Visitors can participate in traditional games, take a ride on the carousel, roast chestnuts and watch jovial entertainers. Father Christmas and Queen Victoria may be spotted roaming the house, as visitors tour the festively dressed rooms. Tickets from £14.50 per adult and £8.80 per child (5-15 years old). This year, the I love Wight Christmas marketwill be taking place at The Garlic Farm. There will be a Santa’s grotto, face painting, Christmas specials in the restaurant and festive music guaranteed to get people in the Christmas spirit. The market will be taking place on 6th, 7th, 13th and 14th December. 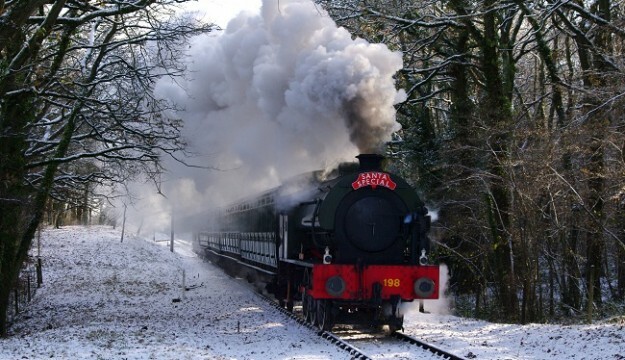 The Isle of Wight Steam Railway’s Havenstreet station will be transforming into a Winter Wonderland this Christmas. There will be live festive music, enetertainment and even Alpacas to meet whilst Rudolph takes a rest. After enjoying all the Christmas celebrations, visitors can hop on board the steam train. Tickets from £14 per adult, £10 per child and £8 per infant. Wightlink’s convenient ferry services take passengers from Portsmouth and Lymington over to the Isle of Wight in just 40-45 minutes.. Alternatively, foot passengers catching the train into Portsmouth only have to walk a few steps to the ferry terminal, where they board the 22 minute Catamaran service that takes them into Ryde pier and back, the perfect route for bringing all your stocking fillers home.